“Well, like, Johnny Winter said, still alive and well until I hear otherwise,” says Carl Baldwin of his Chinatown museum, Velveteria, on a recent Friday afternoon. 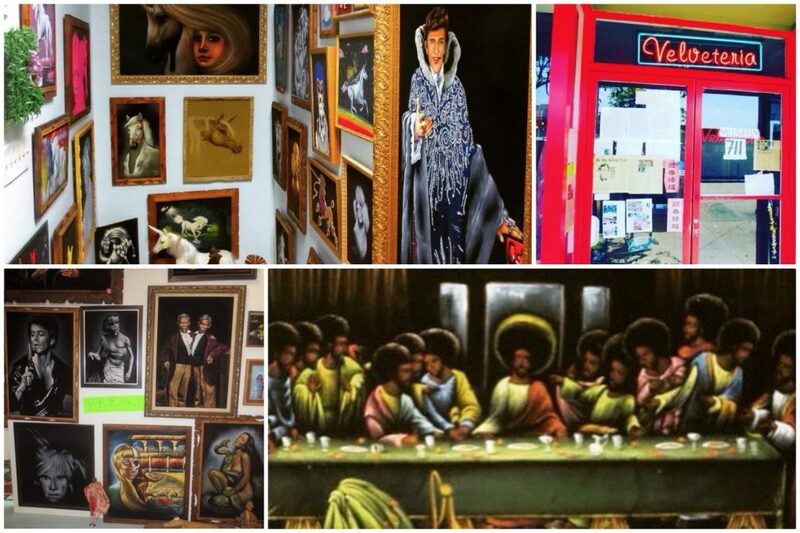 Early in January, Velveteria’s Instagram indicated that the small destination dedicated to velvet paintings would only be open until the end of the month. At the time of our meeting, Baldwin was more optimistic. Days later, via Instagram, Velveteria announced that it would be business as usual through the end of February. But beyond that, the future is a bit more uncertain. Baldwin says that they could stay put longer if business allows for it, noting that they need about 30 guests a day paying the $10 cover for the Velveteria tour. Baldwin was finishing up a tour for two visitors from Arizona on the day that we met. He dropped trivia and opined on the greatness of the 1970s while pointing out features of the “wall of sound,” a collection of rock star portraits executed on canvases of silky black velvet. Part of Velveteria’s allure is the art itself, stunning paintings on velvet that run the gamut from tiki-style art to celebrity portraits to political commentary. But there’s also the curation of the museum, bringing together art that’s often deemed kitschy with vintage magazines and album covers that add insight to the work. Then there’s Baldwin himself, whose wealth of information on velvet paintings and pop culture, combined with a quick wit makes the experience all the more entertaining. Baldwin was impressed with the reaction and thought, “a little pop-up or something” might work. Velveteria opened in late 2005 and went on to attract the attention of Anthony Bourdain and The Tonight Show and led to the book Black Velvet Masterpieces: Highlights from the Collection of the Velveteria Museum. Velveteria garnered a good amount of press in its Chinatown space and has drawn visitors ranging from tourists to high school classes to check out this vast and eclectic collection of velvet paintings. These days, Baldwin is running the day-to-day of Velveteria on his own (Anderson, though still a part of Velveteria, has since moved out of state) and, and he’s working on plans outside of the museum as well. Baldwin says that there’s a documentary in the works, but wasn’t able to give more details at the moment. He’s also looking to do more pop-up and travel events in the future as well. There’s already a pop-up, Clowntacular, scheduled in an Alhambra space for February 16 and Velveteria will participate in the Art in L.A. Affair at Artists Corner Gallery in Hollywood, which opens on February 13. “This is a place about the underdogs,” says Baldwin of Velveteria. And an underdog story continues to play out every day at this temple to outsider art. Velveteria is located at 711 New High St., Chinatown. The museum will be open late on February 9 for the neighborhood’s Chinese New Year celebration. Velveteria’s “Clowntacular” pop-up opens February 16 at 7 p.m. at 1340 West. Main Street, Alhambra, and will be open through the end of the month (Thursdays-Sundays, noon-8 p.m.). “Art in L.A. Affair” opens at Artists Corner Gallery in Hollywood on February 13 and runs through February 17.